As this photo from Theme Park Adventure shows, the Christmas setting may be familiar, but the maniacal mechanical monsters within are totally new. 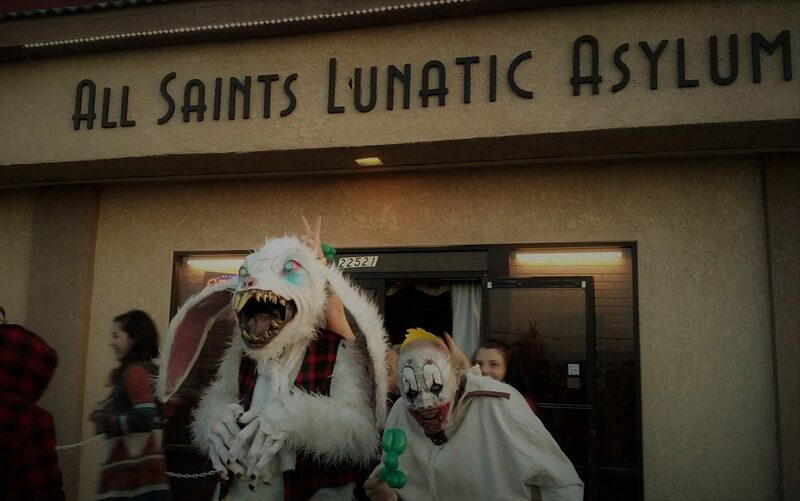 I recently received a letter regarding my Los Angeles Haunted Hayride 2013 Review. I have already responded personally but have yet to receive a reply granting permission to quote the letter or identify the author. Nevertheless, there are a couple of points worth addressing in public, I think. The letter-writer, who is associated with the Halloween attraction, takes me to task on two issues, which I will designate as Novelty and Reality. My review, after listing a few new sights at this year's Los Angeles Haunted Hayride, concludes with a paragraph containing the sentence, "There’s not that much new..." The letter writer points out that, although the sets are the same, the cast of characters populating them is new, with the exception of the church with the titanic demon and the red-eyed cultists. True enough, and I do see that my phrasing could have led readers to believe that they would be seeing the exact same characters who appeared in the Los Angeles Haunted Hayride 2012, which is not the case. 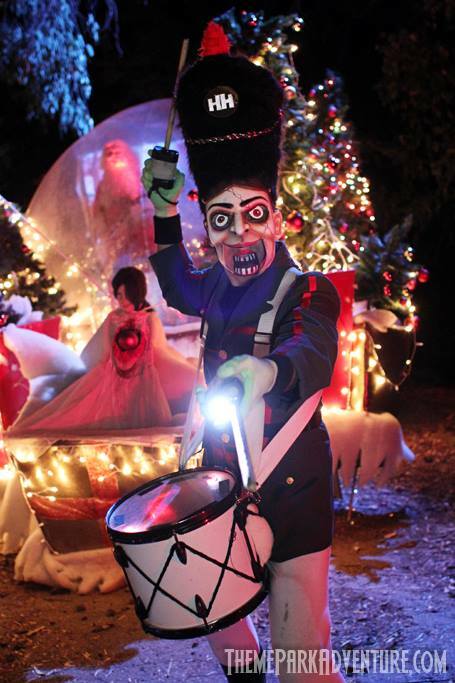 For example, there is another Christmas scene this year, but the life-sized mechanical tin drummers marching through it are completely new - and memorably effective. In my defense, I was trying to convey an overall subjective impression of the haunt, which perhaps does not reflect the objective reality. Take this year's tent scene, which is different - a Baptist Revival instead of a Circus - but also familiar. In years past, the scene would start quietly; then the lights would go out and begin to strobe, while all hell broke loose. For Halloween 2013, instead of turning off the lights, a large black sheet is drawn over the entire audience, and then all hell breaks loose. Being completely covered creates a different sort of thrill, but it's a variation on a theme: start slow, obscure visibility, then go crazy. That's the similarity I was referencing when I said, "There's not that much new..."
My review for the most part dismisses the claim that year's L.A. Haunted Hayride is "based on actual events." The letter-writer points out numerous real-life parallels, some of them specific (such as the burning of an orphanage in 1913) and some of them generic (Salem witch trial hangings). What interests me about this point is that it illustrates the sometimes wide gap between authorial intentions and audience perceptions. To cite one example, an early scene includes silhouetted figures with blue lights emanating from their mouths. It turns out that these characters are inspired by real-life murder cases, such the Black Dahlia, Jack the Ripper, Sharon Tate, and others. Yet I recognized none of them, even though I went through the ride twice, and am fairly familiar with the cases (for instance, I immediately recognized the Helter-Skelter murder scene at Rob Zombie's Great American Nightmare, long before an actor showed up impersonating Charles Manson). Since receiving the letter, I have conferred with other haunt reviewers, who confirm my lack of perception: none of us noticed any similarity with real-life murder victims. For what it's worth, I apologize for any misleading statements. 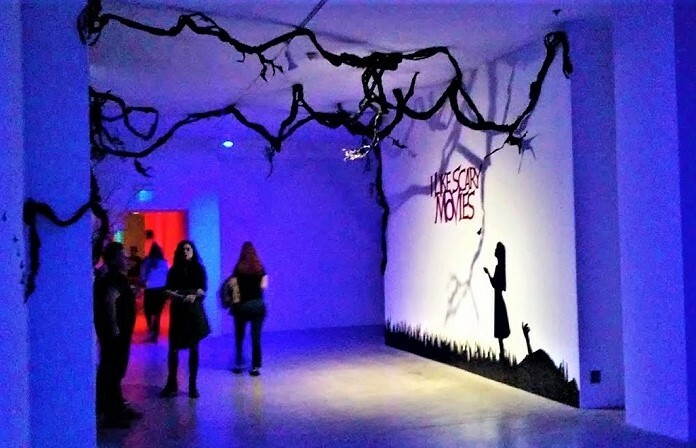 The settings and strategies at Los Angeles Haunted Hayride 2013 will be familiar to fans, but readers should know that the actual characters and scenes within those settings are almost all new.